So no quilt, but a beautiful bed. A beautiful old, $8 church rummage sale find. And she adores her very own bed to pieces. Adores it - it's a lovely place to play. And sleep? Well, sometimes. But we're in no rush for that. So far, she's made no mention of the fact that it's missing a Mama-made quilt. Phew. 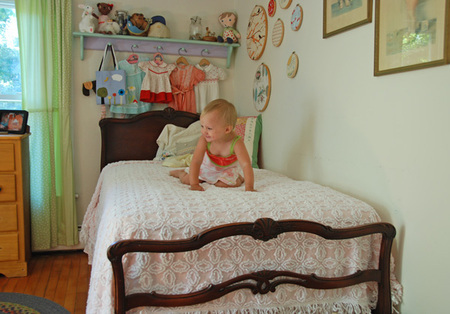 The gorgeous vintage pink chenille spread - a gift to me on my own birthday from a dear friend - was perfectly timed and is perfectly placed on Adelaide's bed until her quilt arrives. 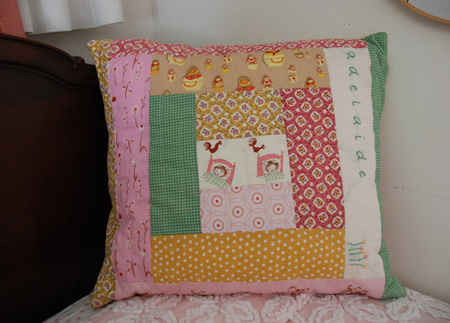 So that there would be something handmade on her bed while her quilt is in progress, I made her this little quilted log cabin pillow with fabrics from her soon-to-come quilt. 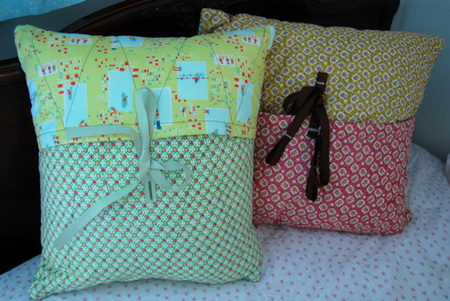 I used the log cabin pillow tutorial from Dacia Ray (thank you!) as a guide. 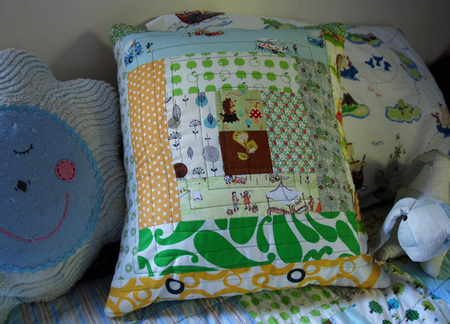 After finishing hers, I dug around the monstrous pile of unfinished projects to unearth this bit of log cabin pillow - started this spring as a precursor to Ezra's quilt. So I quickly finished this one up for him too (which will be a lot less awkwardly squished when I get the proper size pillow form in there).